Concerns are growing for a 20-year-old Iowa student who has been missing for over two weeks. 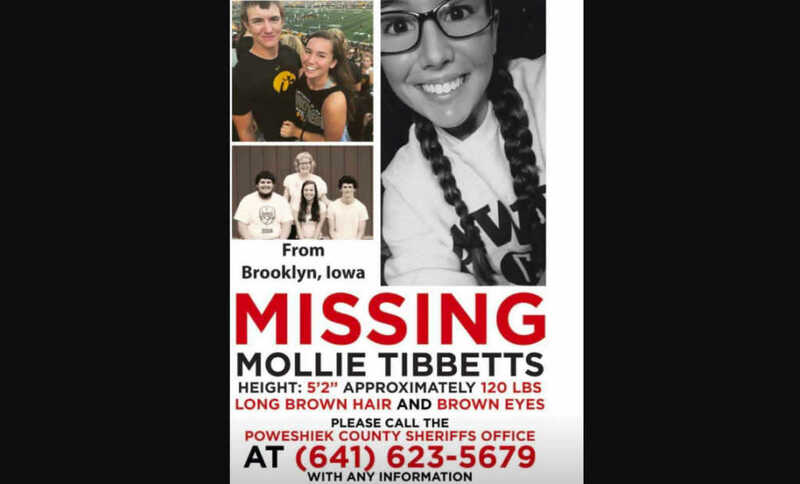 Mollie Tibbetts was last seen jogging in the town of Brooklyn on the evening of July 18. Despite hundreds of police interviews being completed, authorities are no closer to locating the college student. On the day of her disappearance, Tibbetts’s brother dropped her off at her boyfriend’s house so she could dog-sit. According to the sheriff’s office, she was last spotted jogging around 7:30 that evening, wearing gym shorts, a black sports bra and running shoes. She has not been seen since. Her activities at the time of her disappearance have led investigators to scan the data on Mollie’s fitbit device, hunting for clues as to her whereabouts. Authorities have revealed that there was a “possible sighting” of Tibbetts in the Kansas City, Missouri, area at the end of last month. However, CBS News reported that the sighting had been “ruled out by investigators” due to its lack of verification. “We don’t know where Mollie is at right now. And I am not going to draw any conclusions about the circumstances of her disappearance. Other than it is not consistent with her past,” said Kevin Winker, director of investigative operations for the Iowa Department of Public Safety, as reported by CNN. “No one just disappears, no one just vanishes without a trace,” he added. Mollie’s boyfriend and his brother have been ruled out as potential suspects — both were at work at the time of her disappearance. Federal investigators have questioned a local pig farmer who had two previous convictions for stalking. Authorities searched his property and searched his phone for clues — but nothing came of it. Tibbetts’s parents have confirmed that their daughter returned to her boyfriend’s house following her jog, and was doing school work late into the night. I feel like we’re all so invested in Mollie Tibbetts’ disappearance bc we see ourselves, our sisters, or our friends in her. If a small-town Iowa girl can go missing, we all can. Pray or do whatever you do, but let’s not forget her name or face until we have answers. The reward for information leading to Mollie’s whereabouts has risen to $172,000, her family has confirmed. “As of 10 this morning we have raised $172,000 that would be paid to you as soon as Mollie is safely home,” her mother stated. We will keep you posted as this story develops. Please pray for the Tibbetts family, and ask that the Lord would bring Mollie home safely.